قرارگیری در عرض های جغرافیایی متفاوت و تنوع ناهمواری ها از یک سو و ورود سیستم های سینوپتیکی متفاوت در طول سال از سوی دیگر یکی از عوامل عمده اثرگذار بر اقلیم ایران زمین است. یکی از فراسنج های اصلی تعیین کننده اقلیم هر ناحیه دما، به ویژه درجه روز می باشد. درجه روز عبارت است از تفاوت دمای آستانه نسبت به میانگین دمای روزانه،که آستانه های دمایی نیز برحسب اهداف تحقیق مورد نظر انتخاب می شوند. در این پژوهش جمع میانگین تعداد درجه روزهای سرمایش و گرمایش فصلی و سالانه کشور به ترتیب از طریق آستانه های دمایی 11 / 25 درجه و 14 / 25 درجه محاسبه شد. داده های دمای روزانه از از پایگاه داده های اسفزاری استخراج گردید. این پایگاه داده ها شامل میانگین روزانه دما از تاریخ 1/ 1/ 1340 تا 1381/12/29 بر روی یاخته هایی به ابعاد 15×15 کیلومتر بر سراسر کشور است. به این ترتیب میانگین دمای روزانه در پایگاه داده های اسفزاری آرایه ای است به ابعاد 15992×7187 که در آن سطرها بیانگر زمان(روز) و ستون ها بیانگر مکان(یاخته ها) هستند. نتایج پژوهش بیانگر این است که بیشترین میزان درجه روز سرمایش از آستانه دمایی 11 درجه در فصل تابستان و مربوط به سواحل دریای عمان و جلگه خوزستان به میزان 750 - 600 درجه روز و کمترین آن از آستانه دمایی 25 درجه برای کل ایران در فصل زمستان به میزان صفر درجه روز است. در میزان نیاز به گرمایش نیز بیشترین آن از آستانه دمایی 14 درجه در فصل زمستان و مربوط به ناحیه شمال غرب و ارتفاعات به میزان 750 - 600 درجه روز و کمترین آن در فصل تابستان مربوط به کل کشور با آستانه دمایی 14 درجه به میزان 0 درجه روز می باشد. One of the major factors that affect Iran’s climate, is its location in different geographical latitudes and variety of uneven lands on one hand, and entering of diverse synoptic systems during the year on the other hand. One of the main parameters that determinesthe climate of each region is temperature, especially degree-day (DD). DD is the difference of the threshold temperature relative to the average daily temperature, and the temperature thresholds are also selected according to the objectives of the research. In this study, the sum of the average numbers of the country's annual and seasonal heating and cooling degree-day was calculated through the temperature thresholds of 25.11 and 25.14 respectively.The daily temperature data was extracted from the Asfazary database. The databases include the daily average temperature in 41 years from 1961 to 2002 on the 15x15 km. cells throughout the country. Thus, the average daily temperature in Asfazary database is an array of 15992x7187 dimensions in which the rows represent the time (day) and the columns represent the location (cells). The results of the research indicate that the highest cooling degree-day (CDD) is from the 11 degrees temperature threshold in the summer and is about 600-750 related to the coasts of Oman sea and the plain of Khuzistan, and the lowest is from the 25 degrees temperature threshold for the entire Iran in winter corresponding to a zero CDD. Regarding the amount of heating required, the highest is from the temperature threshold of 14 in the winter which is related to the Northwestern area and the heights with a CDD of 600-750 and the lowest is in the summer related to the whole country with a temperature threshold of 14 degrees corresponding to a zero CDD. 1-خلیلی، علی؛ (1378)؛ «تدوین یک­ سامانه جدید پهنه‌بندی اقلیمی از دیدگاه نیازهای گرمایش و سرمایش محیط و اعمال آن بر گستره ایران»: فصلنامه تحقیقات جغرافیایی، شماره 75، صص42 - 34. 2- ذوالفقاری، هاشمی و رادمهر؛ حسن، رضا و پریوش؛ (1388)؛ «تحلیلی بر نیازهای سرمایشی و گرمایشی در شمال غرب ایران»، مجله پژوهش‌های جغرافیای طبیعی، شماره 70، صص 34-21. 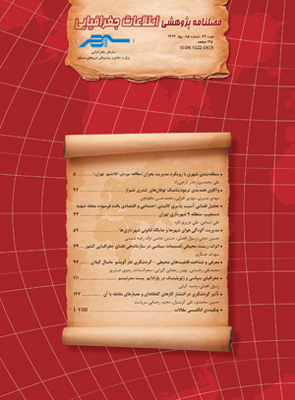 3- مسعودیان و کاویانی، ابوالفضل و محمدرضا؛ (1387)؛ اقلیم­‌شناسی­ ایران، انتشارات دانشگاه اصفهان، چاپ اول، اصفهان. 4-Buyukalaca,Orhan, Husamettin, Bulut, Tuncay, Yilmaz (2001) :Analaysis of Variable-Base Heating and Cooling Degree-Days for Turkey .Applied Energy. 69,269-283. 5-Fengqing Jiang & Xuemei Li & Binggan Wei & Ruji Hu, (2009): .Observed trends of heating and cooling degree-daysin Xinjiang Province, Theor Appl Climatol 97:349–360. 6-Kadioglu,M, Z.Sen (1998):Degree day Formulation and Application in Turkey. j.Appl.Meteor. 38,837-846. 7-Ken Mix &Walter Rast & Vicente L. Lopes (2010):Increases inGrowing Degree Days in the Alpine Desert of the San Luis Valley, Colorado Water Air Soil Pollut (2010) 205:289–304. 8-K.T. Papakostas , A.K. Michopoulos, N.A. Kyriakis,(2009): Equivalent full-load hours for estimating heating and cooling energy requirements in buildings Greece case study, Energy :34 . 1807 –1812. 9-Kadioglu .M., Z. Sen, L. Gultekin,(1998): Spatial Heating Monthly Degree-Days Features and Climatologic Patterns in Turkey, Theor. Appl. Climatol: 64, 263±269. -10-Kadioglu .M., Z. Sen, L. Gultekin,(1998): Spatial Heating Monthly Degree-DaysFeatures and Climatologic Patterns in Turkey, Theor. Appl. Climatol: 649/. 269 ± 263. 11-Kadioglu M, Sen Z.1999/ Degree-day formulations and aplication inTurkey 1999 American Meteorological Society. 12-Li. Chean ,Fang .XiuQi, LI. Shuai,( 2007): Impacts of climate warming onheating energyconsumption and southern boundaries of severe cold and coldregions in China,Springer: 2854-2858. 13-Matzerakis and Christos،(2004):Heating Degree-Days Over Greece as anIndex Of Energy consumption. International Journal Of Climatolojy. 14-Mindy k _ Baumert S .Heating and Cooling Degree Days. (2003):World ResourcesInstitute:1-10. 15- Monjur,.M,2012: Relationship between annual mean temperature and degree-days Energy and Buildings 54 (2012) 418–425. 16-Pallavi B, Manoj Sc, Sadhan M, 2015: Estimation of degree-days for different climatic zones of North-EastIndia . Sustainable Cities and Society 14 (2015) 70–81. 17-Shafiqur Rehman & Luai M. Al-Hadhrami & Shamsuddin Khan)2010(: Annual and easonal trends of cooling, heating,and industrial degree-days in coastal regions of Saudi Arabia Theor Appl Climato.1-10. 18-Thomas, H. S. C., (1952): Seasonal degree days statistics for the United States. Mon Wea. Rev., 80, 143–149. 19-.Taylo, L - Billie r.1981: Population-Weighted Heating Degree-Days for Canada.Atmosphere- Ocean.19(3).261-268. 20-Yildiz. B., Sosaoglu .A, 2007: Spatial distributions of heating, cooling, and industrial degree-days in Turkey , Theor . Appl. Climatol. 90/ 249–261.